The findings of the Great Barrier Reef Outlook Report and the Strategic Assessment of the Great Barrier Reef Region are clear. Impacts on the Reef are compounding over time and space, diminishing the Reef’s ability to recover from disturbances. Greater reductions of threats at all levels — global, reef-wide, regional and local — together with actions to improve the Reef’s health and resilience, are required to prevent the projected decline in the Reef’s health. These policy documents set out a comprehensive and systematic approach for how stakeholders can work together to achieve these outcomes. The Great Barrier Reef Ministerial Forum approved the Reef 2050 Cumulative Impact Management Policy and the Net Benefit Policy on 20 July 2018. These two documents, along with the Good Practice Management for the Great Barrier Reef document, are part of a suite guidance materials to support implementation of the Reef 2050 Plan. 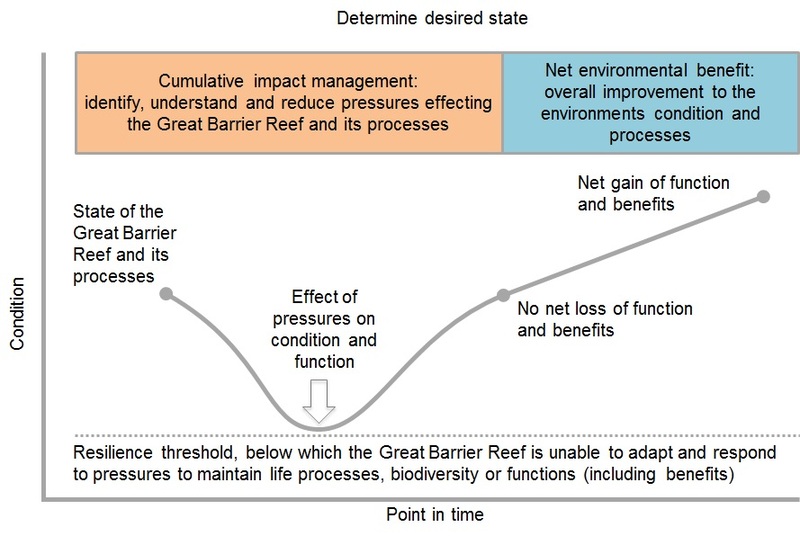 The Reef 2050 Cumulative Impact Management Policy and Net Benefit Policy complement each other by providing guidance on how to reduce threats and improve the Reef’s resilience in the context of continuing climate change pressures. They set out principles and steps to guide their practical application. They’re about everyone working together to protect the Reef. These policy documents form part of the Reef 2050 Plan’s adaptive management approach. Their effectiveness in reducing the risk of threats and improving the condition of values will be evaluated and reported on as part of the Great Barrier Reef Outlook Reporting cycle. Good Practice Management for the Great Barrier Reef sets out foundational considerations for making decisions or undertaking actions that may impact on the Great Barrier Reef. It is part of a suite of policy documents under the Reef 2050 Plan. The cumulative impact management policy outlines a systematic method for managing cumulative impacts on the Reef. All stakeholders can contribute to the reduction of impacts on the Reef and this policy provides guidance on the range of impacts affecting the Reef, the scale at which impacts are occurring and tools to assess and manage impacts. Adoption of this policy at planning, assessment and approval, monitoring, evaluation and reporting phases for decisions and activities within and adjacent to the Reef will ensure threats to the Reef are addressed in a systematic and consistent manner. The policy does not propose an assessment of cumulative impacts for individual decisions or activities where the cumulative impacts have been considered in overarching plans or assessments, and where decisions/activities are consistent with these plans or arrangements. The steps in cumulative impact assessment for the marine area are similar to best practice environmental impact assessment, with a broader focus on understanding the context and underlying pressures on the marine system, its values and desired outcomes. The key performance indicator for the implementation of the cumulative impact management policy will be a reduction in the risk of threats to the Reef as reported in the five-yearly Outlook Report. The net benefit policy provides guidance on designing and implementing programs to improve the Reef's resilience and condition of its values. It is a new approach for protected area management globally. The policy provides guidance on how to deliver net benefit outcomes for the Reef using a diverse range of approaches and working collaboratively with stakeholders at local, regional, national and international scales. Its intent is to drive a strategic and coordinated approach to the delivery of actions designed to improve the Reef’s health and resilience, and to facilitate the effective tracking of actions. The key performance indicator for the implementation of the net benefit policy will be an improvement in the condition and/or trend of the Reef's values as reported in the five-yearly Outlook Report. These Reef 2050 policies are important guidance for delivering the Australian and Queensland governments’ 35-year plan to protect the Reef. The policies were finalised by the Australian and Queensland governments in July 2018. Given the complexity of management, the scale of pressures and threats affecting the Reef, and the complex ecosystem responses, implementation across jurisdictions and sectors will be staged. Policy effectiveness will be evaluated through the Great Barrier Reef Outlook Report and aligned with the review and implementation of the Reef 2050 Plan. The establishment of the Reef 2050 Integrated Monitoring and Reporting Program, together with the development of spatially explicit decision support tools will support the implementation of approaches set out in draft policies. A review of Australian and international literature relevant to these policies has been undertaken by the Great Barrier Reef Marine Park Authority. The review examines contemporary theory and practice related to managing cumulative impacts and achieving no net loss and net benefit outcomes for the environment, and looks at their application to the Great Barrier Reef. As managing cumulative impacts and delivery of net benefit programs and actions are rapidly evolving fields nationally and internationally, we welcome contributions to this body of knowledge.